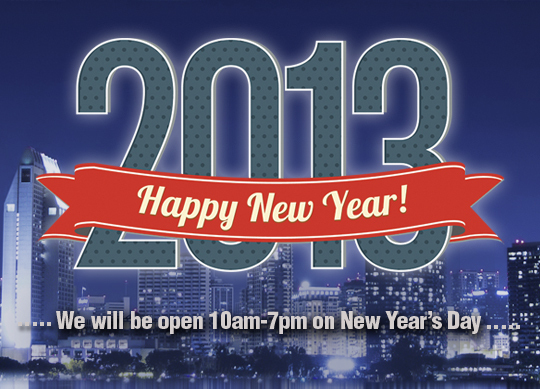 Happy New Year from your friends at Pacific Honda! You have to come by and see the low prices, great financing/ leasing options, and huge selection of new and used cars going on right now. 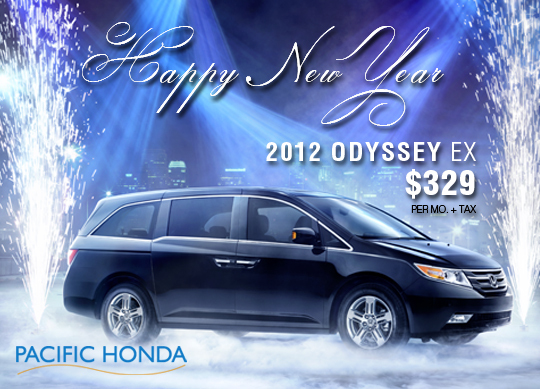 Don't forget to test drive the 2012 Odyssey EX and take advantage of this great leasing option before it's too late! The 2013 Honda Civic: "Things Can Always Be Better"
Honda has officially rolled out the first ad for the 2013 Civic. The one-minute spot focuses on a number of clever inventions that improve on old themes, from rocket-powered parachutes to hover bikes and smart window shades, before shifting to the redesigned compact. Set to Santigold's "Disparate Youth," the ad culminates with the phrase, "Things can always be better." This is likely as close as we'll come to hearing Honda say, "we could have done better." Unveiled at the 2012 LA Auto Show, the 2013 Civic features revised front and rear fascias, nicer cabin materials and an updated suspension just one year after the ninth-generation model debuted. That car received scaling reviews from critics, most notably Consumer Reports, who felt the 2012 Civic was a step backwards for a company known for producing high-quality, economical vehicles. 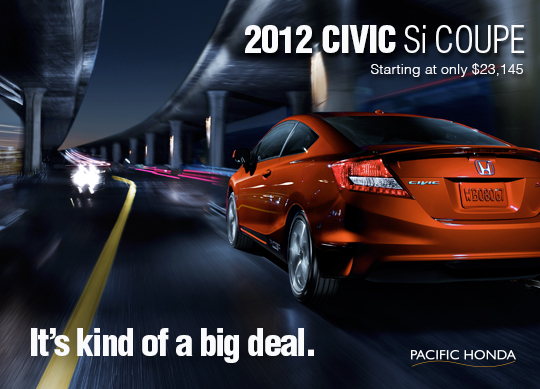 You can check out the full ad for the 2013 Civic below before it debuts during the Rose Bowl. 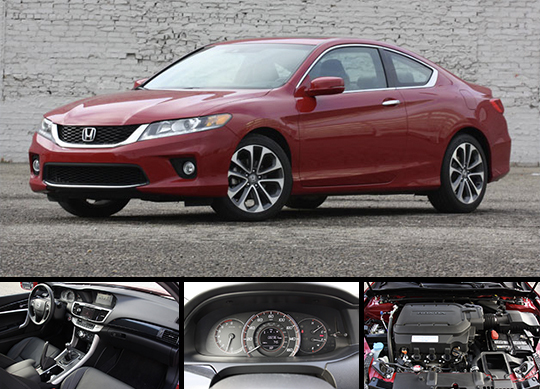 Read through this great review, plus driver's notes for the 2013 Honda Accord Coupe V6 6 MT, and come to Pacific Honda to check out what a fun ride this could be for the new year! One of the first cars I reviewed for Autoblog was – say it with me now – a 2010 Honda Accord Coupe EX-L V6 w/Navi 6MT, perhaps the rarest of all modern Accord models. I mean, think about it: Of all the different Accord variants on the road, how many are coupes? And how many of those have the larger V6 engine? And how many of those are fully loaded with leather, navigation and all the trimmings? And finally, how many of those have option sheets where the only box that isn't checked is the automatic transmission? That has to be something like one percent of one percent, right? So when Honda started rolling its all-new 2013 Accord into the test fleet, I was happy to hear that yet another Coupe EX-L V6 w/Navi 6MT model was available out of the Detroit pool. And while this really isn't the car that serves as the control for judging the entire Accord line, it's still one heck of a sweetheart. It's the Journalist Special all over again. 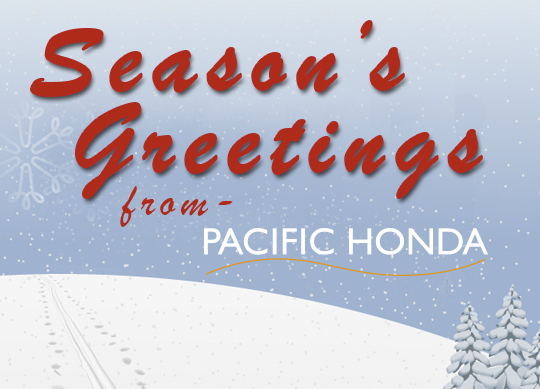 From all of your friends here at Pacific Honda, we would like to send our warmest wishes & hopes that all of your holiday travels are safe, and spent with those you love! 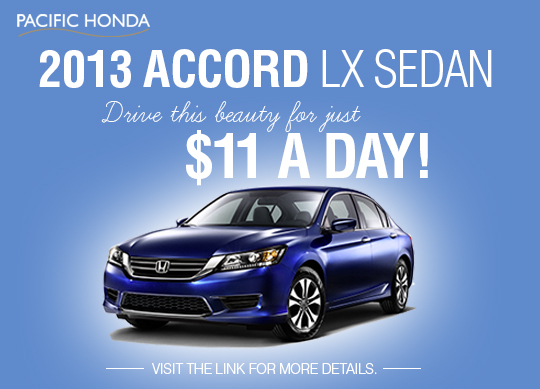 Don't forget to come in and take advantage of all of the Honda Happy Days specials while they last! If you haven't had the chance to get behind the wheel of the 2012 Honda Civic Si Coupe, stop by Pacific Honda and treat yourself to one of the best drives of the year. 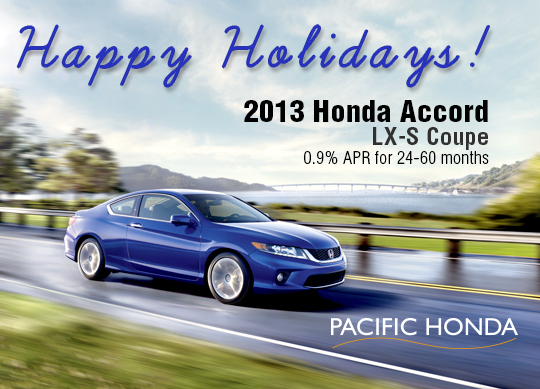 With great financing and leasing options going on right now, Pacific Honda is a one stop shop for all of your great gift ideas and holiday specials! Just one model year after a complete redesign, Honda saw fit to make some pretty big changes to the Civic for 2013. Now, with the car about to hit dealers, we're getting our first look at the company's advertising direction for its high-volume compact car. Done as a comic-book-style action cartoon, this video is for the sportier Civic Si models and is obviously geared toward younger, more enthusiast-oriented buyers. In the video, our two hero drivers pilot a Civic Si coupe and sedan against a bunch of Mad Max-like vehicles with Tron-like consequences. Like any good commercial, this ad crams many of the car's key features into the two-minute video showing off new features like Bluetooth and a text message reader. 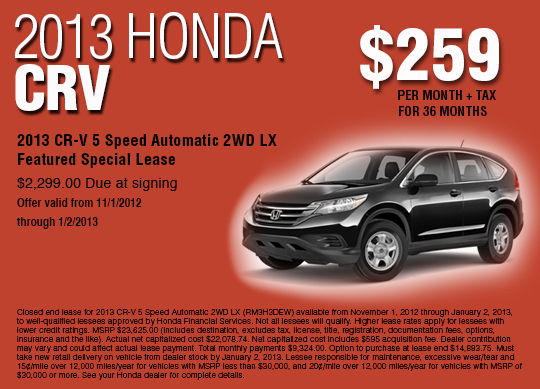 Come in to Pacific Honda today and test drive a 2013 Honda CR-V. Check out our 36 month financing options and great deals to bring in the new year!! 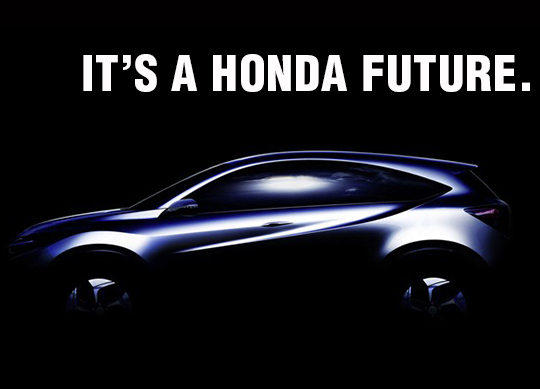 "Honda released this teaser image today of a new small crossover concept that will debut at the Detroit Auto Show in January. The Japanese automaker did not offer up any specific details about what to expect from the new CUV concept, only saying that it is a "global concept model combining a sporty and dynamic SUV profile with a spacious, functional interior." This concept likely previews the upcoming Fit-based crossover that we've told you about before. Honda is expecting the next-generation Fit to sell something like 200,000 units annually, largely thanks to an expanded model range that is said to include a new sedan in addition to the CUV previewed here. We'll have the full details when the new concept bows in Detroit next month." Don't just celebrate with holiday cheer, dream big with Honda for a band new year! 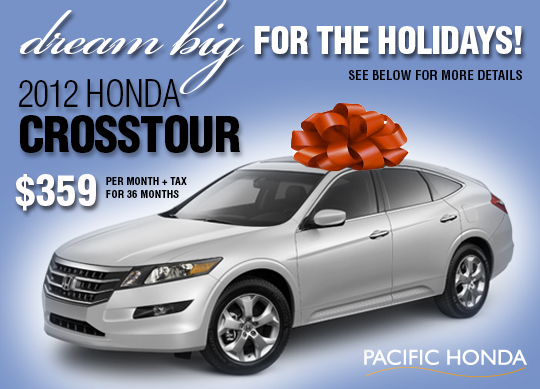 Come in to Pacific Honda this holiday season to check out the great deals on any 2012 Honda Crosstour.